The fire stability of reinforced-concrete structures and supports is ensured by limiting temperature increases in the steel and framework enclosed in the concrete. Forecasting methods to calculate the behaviour of concrete structures in the presence of fire are described in Eurocode NF EN 1992-1-2. 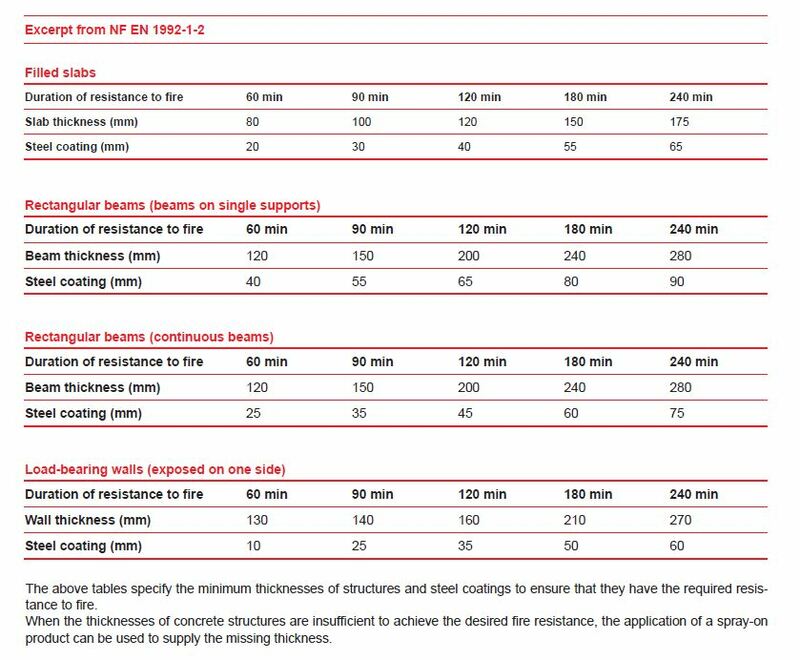 They specify that concrete structural elements are fire resistant for 2 hours when their minimum thickness is 12cm and the coating on the steel is 4cm thick. In nearly all buildings, the coating is normally 2 cm. It is for this reason that concrete elements require fire protection that compensates for this difference in thickness. The undersides of concrete floors are protected in exactly the same way as other structural elements, with the same fire-resistant products. The undersides of concrete or ceramic floor slabs with a grooved underside are protected in the same way as other structural elements with the same protective products. For a ceramic floor slab protected with FIBROFEU®, a sheet of expanded metal is required. Fibrous coatings made from mineral wool (FIBREXPAN®, FIBROFEU®). A product is selected depending on various factors specific to the construction site.